This section represents the engineering and application considerations that are inherent in the design and operation of the equipment. 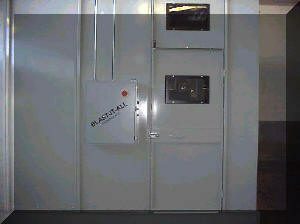 The modular blast room is specially ventilated and illuminated for enclosed abrasive blasting, and is a fully sealed, dust tight, all steel structure. 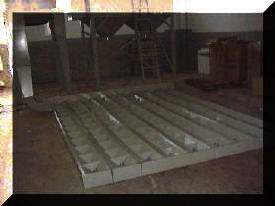 The components are prefabricated for simple bolt-together erection, with little or no job site welding required. The enclosure stands by it’s own structural support with out connections to the surrounding facilities. 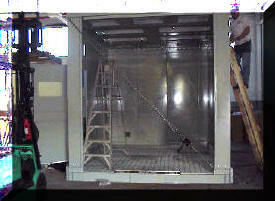 Internally, the enclosure has no areas, other than the floor, where airborne media or dust may be captured. Proper reclaim and classification of the blast media is important to the efficiency and repeatability of the cleaning process. The reclaim and classification systems have been developed over many years of research and field experience to provide the most efficient reclaim for reusable media, and separation of broken media as well as dust and debris. Blast-It-All® uses a pneumatic floor system that utilizes controlled high velocity air flow to convey the blast media to the cleaning and classification system. The system consists of one or more sections, which are connected to a transition. 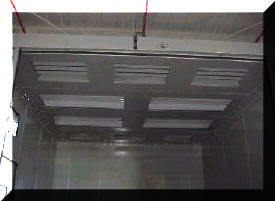 Steel bar grating covers the entire floor system. The pressure blast machine is designed for this intended purpose. The vessel is designed in accordance with ASME Section VIII, Division 1 requirements for unfired pressure vessels. 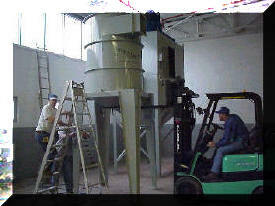 The machine allows for automatic filling of media when the vessel is depressurized. Closure of this filling valve entails a rubber to rubber seal to ensure a leak-proof seal. An inverted semi-elliptical head is used in the top section to allow storage of media for entry into the vessel and a toriconical head is used for the lower section to allow smooth even flow of media to the metering valve. A 6″ x 8″ hand-hole is provided for maintenance and inspection access. The machine is fitted with remote control valves that allow the operator to start and stop the blasting process from the nozzle as well as causing the blast action to stop should the operator accidentally drop the nozzle. The adjustable media flow control valve is mounted at 45 degree to the air stream for minimal turbulence as media enters into the blast stream. The blast hose is heavy duty lined for abrasive resistance and is coupled with externally mounted hose couplings to prevent turbulence and reduce wear. The blast nozzle is a venturi design to offer high exit velocities and is carbide lined to offer wear and durability. The operator protective helmet is made of high density polyethylene construction and provides even distribution of air flow for operator comfort. Compressed air supply to the helmet is controlled by the operator with belt mounted controls. Leather gloves are also provided. Breathing air is supplied through an air filter to remove mist and particulate. 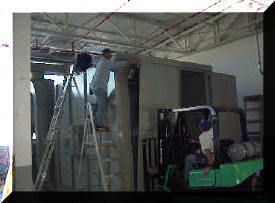 The safety equipment is manufactured by Bullard and is a NIOSH approved system. 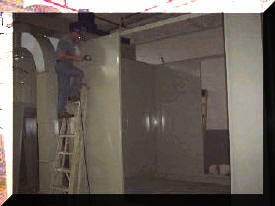 The dust collection system is of Larry Hess & Associates own design and manufacture. 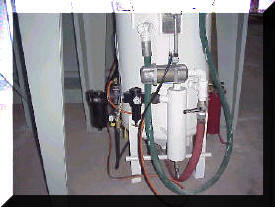 It is dry air system with continuous on-line filter cleaning. The system is supplied with an appropriately sized high capacity exhauster, pneumatic and electrical controls. The system is designed and built for efficient operation and is the result of years of research and experience in dust collection systems for the abrasive blast cleaning industry. 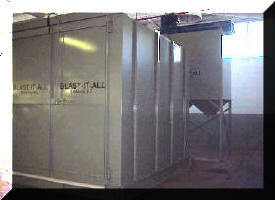 The control panel for the blast cleaning facility is designed and manufactured following all safety regulations. All appropriate motor starters and controls are included with the control panel.